Last September we had the honour of working with Michael Kiwanuka on his second album ‘Love and Hate’. Writing the string arrangements for this was a wonderfully collaborative process with both Michael and producer INFLO contributing ideas and melodies. Working on arrangements with the artist and producer is my favourite way of working. Most of the tracks including ‘ Father’s Child, ‘Black Man in a White World’, ‘Falling’, ‘Rule the World’ and 'Final Frame’, we recorded at Metropolis in London with the exception of ‘Cold Little Heart’ and 'Love and Hate’ which were recorded at Mary Magdalene Church in Holloway. 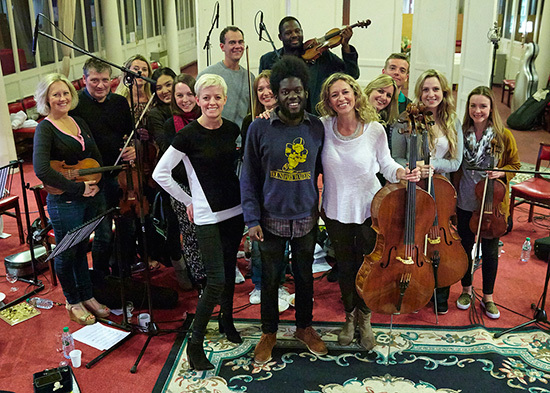 Here’s a photo of Wired Strings at Mary Magdelene Church after recording ‘Cold Little Heart’.